So recently I had been having trouble with the whole "turn the key and Passlock makes you late for work" issue a lot of us are encountering now that our vehicles are getting up there in years. I noticed mine at least only seemed to act up when it was below freezing out. During the warmer months I never had any issues. I finally got sick of it and decided to try disassembling the ignition switch to see just what might be causing the problem. I know some people blamed it on having a bunch of stuff on your keys, and there were other reasons people gave as well, so I wanted to see what it really was. After pulling the switch out and disassembling it, I determined several things, and formed at least one hypothesis for the failures. First thing is, the ignition switch itself is easily removed and replaced without needing to mess around with the tumbler. You can get a brand new one for about $40-$50 or so and simply swap it out and supposedly do a relearn procedure, or take it to someone with a Tech 2 and have the relearn done that way. 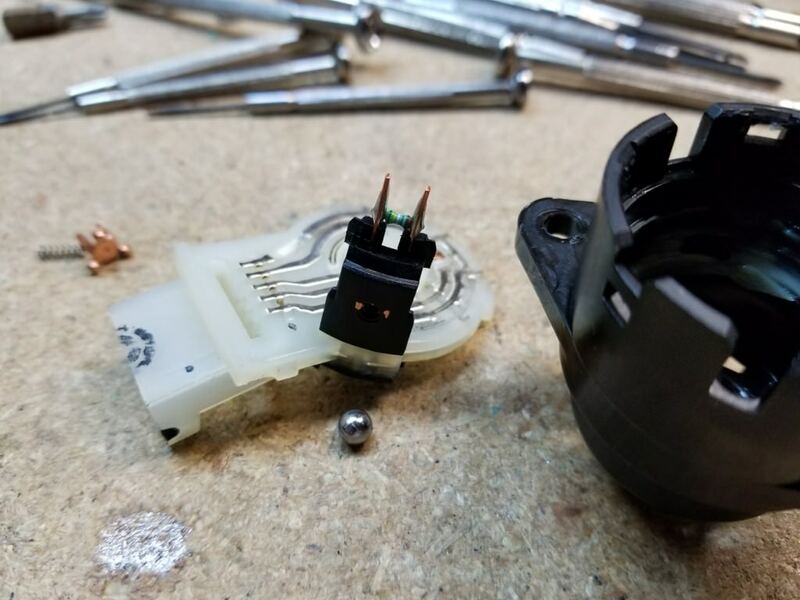 Another is that the resistor for the whole Passlock setup is located as an integral part of the ignition switch itself, and with the way the switch is designed it will be physically destroyed if someone does manage to pull the tumbler out and try to use a screwdriver to start the car. It's also improbable to be able to remove just the ignition switch, as you have to turn the key to On first before the ignition switch will pull out. 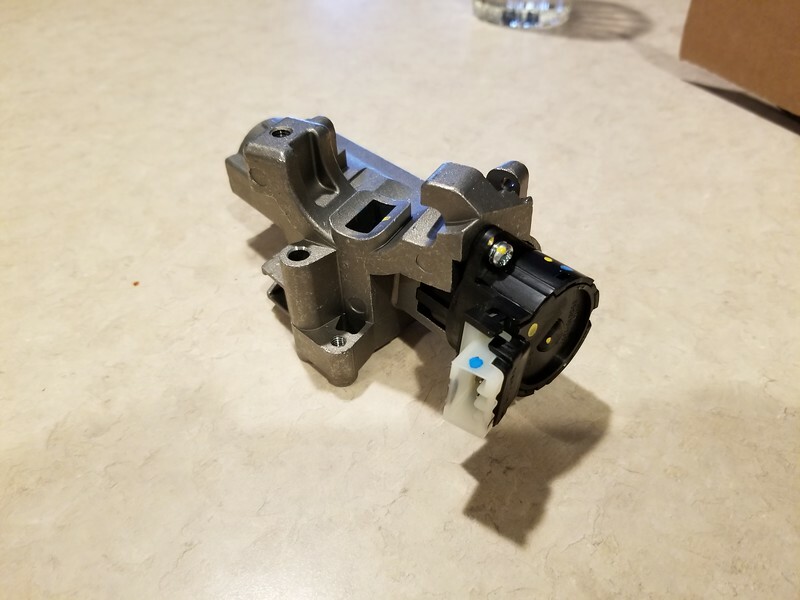 Third, having heavy keychains won't impact the ignition switch itself, as the ignition switch has some float built into it, plus the shaft that connects the tumbler to the switch is very solid and has little if any movement. You're more likely to affect the actual tumbler mechanism than the ignition switch. 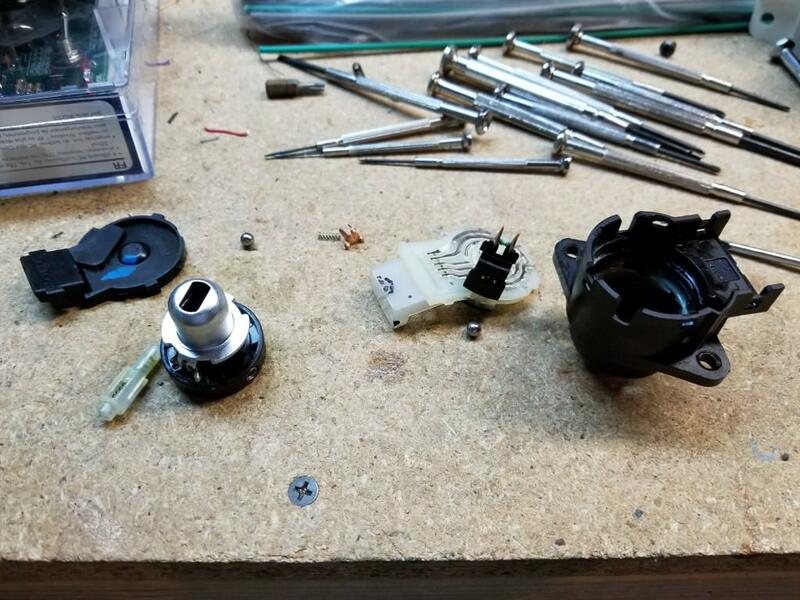 Here's some pics of the ignition switch disassembled. Forewarning, unless you really know what you're doing, I do NOT suggest disassembling your own switch, as it was quite a pain getting it back together. I was able to do it, but barely, and I was especially driven to get it back together since I didn't have a replacement for it. The biggest issue is getting the ball detents back in place, there are two of them so it makes it really tricky to get them back in. This last one is a shot of the switch contacts. On the other part there is a set of phosphorous bronze springy fingers that contact the pads on the bottom, and a stamped phosphorous bronze three point contact that has a spring behind it to force it down. The circuit for the resistor is completed using the contacts at the bottom of the pic and the three fingered contact in the rotating part. 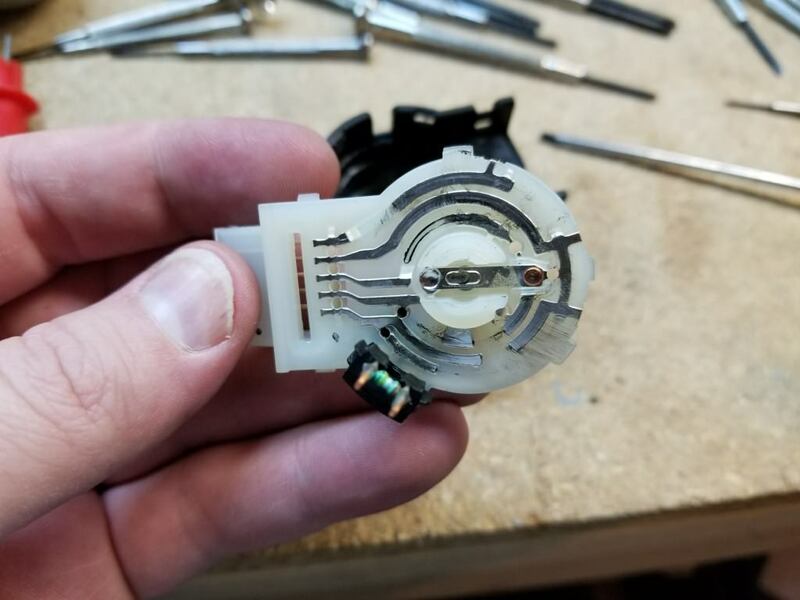 The center of the switch has a plunger that is pushed down when you insert the key that pushes on the set of contacts you can see in the pic. After inspecting everything and figuring out how exactly the switch works, my theory is that over time the grease starts getting a build up of wear particles from the contacts and eventually creates intermittent shorts for the resistor, or at least changing the value of it. You cannot tell from the last pic as I had already wiped away the built up grease and wear particles, but you can see kind of what it looked like if you look at the top part of the pic. I could be completely wrong, but so far I haven't had a single issue since I took the switch apart and cleaned it. That was back on December 8th, so it's been about a month and a half now. While it's possible to take the switch out and spray it with electrical cleaner, I'm not sure how effective it'd be since it'd need to remove the grease, and then you're stuck with a switch that doesn't have any lubrication in it anymore and can suffer additional failures. Ironically, my H3 failed today just like Chris' did. I have the ignition housing and switch already (bought it a couple of years ago) we we're going to put that in soon. I don't know why they don't sell the resistor portion separately. I've never replaced the whole switch, just swapped in the back half every time. I know this thread hasn't had much recent activity, but I wanted to share with you guys that I also replaced the little black part on the ignition housing (ignition switch I guess) and I when I went to do the relearn procedure, it just cranked right up... my only thought was that I had left the key in the 'on' position when I reconnected my battery cables and maybe that did something. Can anyone tell me why I bypassed the whole relearn procedure? Alex, Do you have a part number for this? This is one problem I have on my truck that started around the 100K mark. I definitely have to fix this before this truck goes anywhere. This PassLock problem seems to arise when the weather gets cold and rainy. H3T Ignition switch or electrical issue?